A local dispensary is giving back to veterans with a donation that will go towards build them a new place to live. Austin Carter reports. 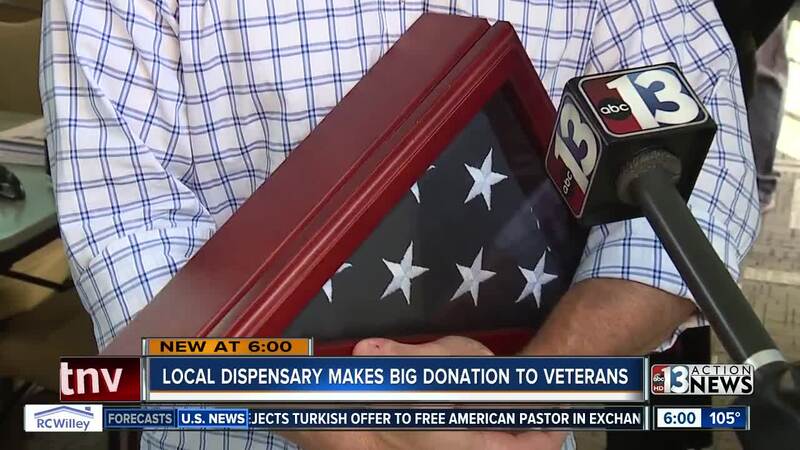 A Las Vegas dispensary is giving back to local veterans with a donation that will go toward building them a new place to live. Inside Veterans Village on Monday, a housing development for those who served our country. Pisos Dispensary presented a donation check for $27,000. For Chad Christensen, owner of Pisos, this donation hits home. Christensen’s passion turned into generating the right amount of money to finish a big project at the Veterans Village. The complex is taking re-purposed shopping containers and turning them into living quarters for veterans. These container homes will be an add-on to the existing housing complex for veterans at Veterans Village near Fremont and Bruce. "This is the contribution that we need, and this has been a shot in the arm for us," says Arnold Stalk of Veterans Village. Many say this is just the beginning for community outreach from the cannabis industry. In March of 2017, Essence Vegas donated over $14,000 to Veterans Village and in December of 2017, Exhale Dispensary collected gifts from their customers for Toys for Tots. The+Source, with dispensaries in Henderson and Las Vegas, collected 156,112 pounds of food for Three Square food bank over the holidays in 2017. John Laub of the Las Vegas Medical Marijuana Association says helping the community is a promising narrative that has spread across dispensaries in town. Veterans will be able to walk through the doors of their new container home by Veterans Day of this year.